Venice - a fascinating city with an enchanting atmosphere that invites not just romantics to glide through countless canals, both large and small. Experience Venice’s glittering history on a ride through the city’s 1,000-year history as you proceed past magnificent palazzi on the way to the majestic Rialto bridge in the middle of the Grand Canal. 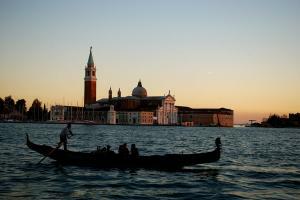 The gondola, a traditional Venetian boat that originated in the 11th century, is one of the city’s many famous emblems. Originally brightly painted and richly decorated, Venetian gondolas today are all black after a law was passed in 1562 banning such displays of conspicuous wealth by the aristocracy and patricians who competed to have the most sumptuous gondola. The gondola serenade accompanied by popular Italian songs performed by the musicians and singers who ride with you, is the best way to penetrate this unique city and experience the pulsating Italian way of life. See Venice from the water – a must for every visitor to this fantastic city! Outside the Gritti Palace Hotel at the Santa Maria del Giglio gondola service stop.